Posted on June 25, 2017 June 9, 2018 by NGCHS, INC. The Mogollon Rim is approximately 200 miles long. Starting in northern Yavapai County it runs eastward ending near the border with New Mexico. It is the southern edge of the Colorado Plateau and the reason our area is called Rim Country. 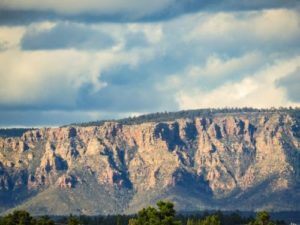 This place called the Rim Country embraces a 50 mile radius around the town of Payson. The area is named after the Mogollon Rim. The spectacular escarpment rises 2000 feet above the foothills and canyons dominating the lives of all who live and visit in the area. When Zane Grey’s travels brought him to Payson in 1918, he hired a guide of the pioneer Haught family to take him to the top of the Rim. “At last we surmounted the rim,” he wrote in Tales of the Lonely Trails, “from which I saw a scene that defied words. It was different from any I had seen before. Black timber as far as the eye could see! Then I saw a vast bowl of forested ridges, and dark lines I knew to be canyons. For wild rugged beauty I had not seen its equal. Zane Grey was a latecomer in a centuries old line of people who discovered this land and loved it. Artifacts found in the Rim Country mark the presence of an ancient people who hunted here as much as 10,000 years ago. Potsherds and grinding stones of a later people are found everywhere. These people lived here from AD 600 until approximately 1350. They are called “the Ancient People”. They were agricultural clans and left behind the remnants of their pueblos and cliff dwellings. 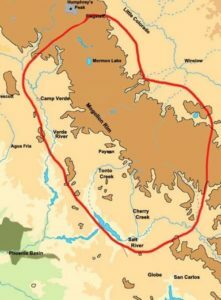 After they left, probably due to over population, overuse of the land and a long drought, new groups of Native Americans took over the Rim Country. Yavapia entered from the west. Apache came into the area from the north and east. These were the Yavapai entering from the west and the Tonto Apaches entering from the north and east. For several hundred years their world was untroubled except by rivalries between their bands. By the 1850s White trappers and gold prospectors encroached upon the Rim Country. The Arizona Territory was formally established in February 1863. A government was seated west of Rim Country near present day Prescott. With the discovery of gold in that area, miners and ranchers began to come in great numbers. Rim Country Indians could not resist the temptation to raid their herds. Those raids brought retaliation. Soon the Apache War was under way. The U.S. government surrounded Rim Country with army posts from which to pursue the war. The guerrilla tactics of the natives made traditional warfare impossible. By continual harassment, destroying their food supply and driving them into the mountains during the cold winters, the Army finally subdued the Apache/Yavapai people. They were incarcerated on reservations in the 1870s. This allowed European-American settlers to come in with cattle ranches and mining operations. Villages were formed to serve the growing white population – Strawberry, Pine, Gisela, Young and Payson. Payson was named in 1884 after an Illinois Congressman who sponsored a bill establishing the Post Office. That same year, local cowboys got together near the village of Payson to hold a rodeo. It became an annual affair called “The August Doin’s”. It has been held every summer since. In the 1890s military control of the San Carlos Reservation was relaxed. The Apache people began to drift back to the places of their birth. Finding the land now occupied by settlers, they camped wherever jobs were available, and began to establish a working relationship with the new landholders. During this same period so many cattle, sheep and goats were brought in that the land was irreversibly eroded. In response, the government formed the Tonto National Forest in 1907 to preserve the land and its watershed. Sheep were limited to “driveways”, goats were eliminated from the forest, and cattle ranchers had to operate under strict grazing allotments. After the turn of the century, the coming of automobiles forced the improvement of roads. Rim Country began to open up to the outside world. Until then pioneers struggled to bring their families and earthly goods in wagons, but travel in and out for supplies was limited to burro trains and foot paths. Population and agricultural growth in the Phoenix area called for the control and salvaging of water that flowed along the Salt and Gila rivers from the central mountains. The first of many reclamation dams to be built was the Roosevelt Dam dedicated in 1911. Building of the dam provided employment for both settlers and Apaches in the area. It also resulted in development of the Apache Trail. The first usable auto road from the Valley to Rim Country. 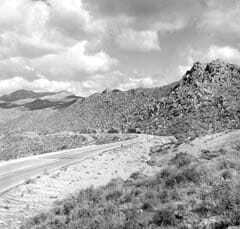 In the 1920s a second auto road into the area was forged over the Mazatzal Mountains. Bush Highway was named after a Valley businessman Harvey Bush who promoted it. To travel from the Valley to Payson, this rough grade required a minimum of 5 hours, usually more, accompanied by blowouts and other necessary repairs. It was not until 1958 that the first paved road entered the Rim Country, Highway 87, also known as the Beeline Highway. This was the beginning of intensive population growth. Rim Country became a haven for summer and winter visitors seeking its many recreational opportunities.